FERDINAND king of Navarre, BIRON, LONGAVILLE and DUMAIN enter. Let fame, that all hunt after in their lives, Live register'd upon our brazen tombs And then grace us in the disgrace of death; When, spite of cormorant devouring Time, The endeavor of this present breath may buy That honour which shall bate his scythe's keen edge And make us heirs of all eternity. Therefore, brave conquerors,—for so you are, That war against your own affections And the huge army of the world's desires,— Our late edict shall strongly stand in force: Navarre shall be the wonder of the world; Our court shall be a little Academe, Still and contemplative in living art. You three, Biron, Dumain, and Longaville, Have sworn for three years' term to live with me My fellow-scholars, and to keep those statutes That are recorded in this schedule here: Your oaths are pass'd; and now subscribe your names, That his own hand may strike his honour down That violates the smallest branch herein: If you are arm'd to do as sworn to do, Subscribe to your deep oaths, and keep it too. Fame, the thing that we all want in our lives, should be engraved brazenly onto our tombs, commanding us respect even after death has destroyed us. In spite of time's quick passing, the things we have done while alive can embolden us to fight honorably against death and ensure we are remembered forever. Therefore, my brave conquerors, for that is what you are, our recent agreement will be binding and help us to fight the war against our own passions and the desires of this great world. Navarre will be the wonder of the world. Our court will be like a little university, a place to stop and think about how to live our lives. You three men, Biron, Dumain and Longaville, have promised to stay with me for three years as my fellow scholars, and to obey the rules that are written down in this agreement here. Your oaths have been pledged and now you must sign your names, so that if you break even the smallest detail of this agreement, you will have lost your honor by your own hand. If you are prepared to do what is written here, then sign your names and keep these promises. I am resolved; 'tis but a three years' fast: The mind shall banquet, though the body pine: Fat paunches have lean pates, and dainty bits Make rich the ribs, but bankrupt quite the wits. My loving lord, Dumain is mortified: The grosser manner of these world's delights He throws upon the gross world's baser slaves: To love, to wealth, to pomp, I pine and die; With all these living in philosophy. My loving lord, I am embarrassed by these things. The rude nature of these worldly pleasures should be left for the lowlifes of this world, like slaves. Let them love, indulge and do extravagant things, I will suffer and die with all the people who have chosen knowledge and wisdom instead. I can but say their protestation over; So much, dear liege, I have already sworn, That is, to live and study here three years. But there are other strict observances; As, not to see a woman in that term, Which I hope well is not enrolled there; And one day in a week to touch no food And but one meal on every day beside, The which I hope is not enrolled there; And then, to sleep but three hours in the night, And not be seen to wink of all the day— When I was wont to think no harm all night And make a dark night too of half the day— Which I hope well is not enrolled there: O, these are barren tasks, too hard to keep, Not to see ladies, study, fast, not sleep! Now that they have finished talking, I feel that I have to say something. My dear lord, I have already promised to study here with you for three years. But as to the other things which you want us to promise: to not see a woman this entire time, which I hope is not written there; to fast for one day a week and to only eat one meal every other day, which I also hope is not written there; to only sleep for three hours every night and to not close your eyes at all during the day, when all I want is to sleep all night and for half of the day as well, I hope is not written there! Oh these tasks are pointless and will be too hard to keep, not to see women, to study, and to not even eat or sleep! In your oath you promise to give up these things. Let me say no, my liege, an if you please:I only swore to study with your graceAnd stay here in your court for three years' space. Then I must say no, my lord, since I only promised to study with you and stay in your court for three years. You swore to more than that Biron. By yea and nay, sir, then I swore in jest.What is the end of study? let me know. Perhaps I did, sir, but I was only joking. Tell me, what is the point of this study? Well, of course, to know things that we didn't know before. Are you talking about things that common sense hides and conceals from us? Why yes, that is the divine advantage of study. Come on, then; I will swear to study so, To know the thing I am forbid to know: As thus,—to study where I well may dine, When I to feast expressly am forbid; Or study where to meet some mistress fine, When mistresses from common sense are hid; Or, having sworn too hard a keeping oath, Study to break it and not break my troth. If study's gain be thus and this be so, Study knows that which yet it doth not know: Swear me to this, and I will ne'er say no. Okay then, I will promise to study as you wish, and will hopefully find out the things which I am not meant to know. It shall be like this: I must study where I eat, even though I am now forbidden to eat at all; I must study where I could meet beautiful women, as all beautiful women are hidden from common sense. Or, if I have committed myself to an oath which is too hard to keep, I must learn how to break it without breaking my faith. If this is the purpose of study, then studying has a lot to learn itself! Come on then, I will swear to this oath, and I will never say no to anything. These be the stops that hinder study quiteAnd train our intellects to vain delight. These things are the obstacles that stop us from studying and tempt our minds to pointless pleasures. Why, all delights are vain; but that most vain, Which with pain purchased doth inherit pain: As, painfully to pore upon a book To seek the light of truth; while truth the while Doth falsely blind the eyesight of his look: Light seeking light doth light of light beguile: So, ere you find where light in darkness lies, Your light grows dark by losing of your eyes. Study me how to please the eye indeed By fixing it upon a fairer eye, Who dazzling so, that eye shall be his heed And give him light that it was blinded by. Study is like the heaven's glorious sun That will not be deep-search'd with saucy looks: Small have continual plodders ever won Save base authority from others' books These earthly godfathers of heaven's lights That give a name to every fixed star Have no more profit of their shining nights Than those that walk and wot not what they are. Too much to know is to know nought but fame; And every godfather can give a name. Well aren't all pleasures pointless? Although the most pointless, the thing which requires work to get, and also comes with suffering and difficulty, is the effort required to make sense of a book to search for the truth. Your vision is clouded by lies and treachery; eyes, which are searching for knowledge, often make themselves unable to see properly. So, before you can find the skill to understand obscure knowledge, you lose the ability to understand anything because your eyes no longer work. Let me study how to please an eye instead, by giving me a beautiful woman's eye to gaze into, I will be dazzled, and that more beautiful eye will be my focus and will give me back the power to see. Study is like the sun, it shouldn't be looked at with rude glances—people who constantly do dull work have never learnt much, except common material from other people's books. The astronomers who have named every star don't get any greater benefits from the shining night sky, than the people who walk around and don't know what any of them are. People who know too much, only learn for the fame it brings them, but anyone can have a name. How intelligent he must be, to even argue against reading! He argues well and stops us in our learning. He pulls out the wheat, and leaves the weeds to keep growing. When geese lay their eggs, it means that it is almost spring. Something appropriate to its place and time. There is nothing in reason. Then follow with something in rhyme. Biron is like an envious sneaping frost,That bites the first-born infants of the spring. Biron is like an evil, biting frost, that eats away at spring's young flowers. Well, say I am; why should proud summer boast Before the birds have any cause to sing? Why should I joy in any abortive birth? At Christmas I no more desire a rose Than wish a snow in May's new-fangled mirth; But like of each thing that in season grows. So you, to study now it is too late, Climb o'er the house to unlock the little gate. Well what if I am? Why should the arrogant summer show off before the birds have a reason to sing? Why should I enjoy such an unnatural event? When it is Christmas, I don't hope to see a rose; when it is May and the ground is covered in flowers I don't hope to see snow—I simply enjoy the things that do grow in that season. This is the same as your decision to study now, it is completely pointless. Fine, don't sign the oath. Go home, Biron, see you later. No, my good lord; I have sworn to stay with you: And though I have for barbarism spoke more Than for that angel knowledge you can say, Yet confident I'll keep what I have swore And bide the penance of each three years' day. Give me the paper; let me read the same; And to the strict'st decrees I'll write my name. No, my good lord. I have promised to stay with you. Even though I have spoken more against this study, than you have been able to in favor of this "divine knowledge," I am confident that I will stick to this oath, and endure this punishment every day for three years. Come on, give me the paper. I will read these promises and then sign my name to these extreme rules. At least it saves you from the shame of not agreeing! [Reads] 'Item, That no woman shall come within amile of my court:' Hath this been proclaimed? [Reading] "The first item—that no woman will come within a mile of my court." Has this been announced? Let's see what the punishment would be. "She would lose her tongue." Who came up with this punishment?! To scare them off with such a harsh punishment. This is a dangerous law that goes against good manners. 'Item, If any man be seen to talk with a woman within the term of three years, he shall endure such public shame as the rest of the court can possibly devise.' This article, my liege, yourself must break; For well you know here comes in embassy The French King's daughter with yourself to speak— A maid of grace and complete majesty— About surrender up of Aquitaine To her decrepit, sick and bedrid father: Therefore this article is made in vain, Or vainly comes the admired Princess hither. "The next item, if any man is seen talking to a woman within these three years, then he will have to endure whatever public shame the rest of the court can come up with." My lord, you are going to have to break this rule yourself! Did you forget that the French King's daughter is coming here as an ambassador to speak with you? She is a lady of charm and perfect dignity, and wishes to speak with you about the possibility of giving up Aquitaine to her weak, sick and bed-bound father. Therefore, this rule is pointless, or else it is pointless for the admired Princess to come here. What do you think of this, lords? I had quite forgotten about it. So study evermore is overshot:While it doth study to have what it wouldIt doth forget to do the thing it should,And when it hath the thing it hunteth most,'Tis won as towns with fire, so won, so lost. Look, once more studying has ignored its own boundaries. Although it wants you to learn all the things that you wish to know, it forgets the things that you need to know! Even when it has the thing that it wants the most, it is destroyed, just like a town that has been captured with fire. We must of force dispense with this decree;She must lie here on mere necessity. Then it is vital for us to get rid of this rule, it is an absolute necessity that the Princess stays here. I predict that necessity will make us all break these promises three thousand times within these three years. For every man is born with his own desires, and these cannot be controlled by anyone, except God. If I break any of these promises, then let it be said that I only did it out of "mere necessity." With this in mind, I will sign my name to the rules that remain. And he that breaks them in the least degree Stands in attainder of eternal shame: Suggestions are to other as to me; But I believe, although I seem so loath, I am the last that will last keep his oath. But is there no quick recreation granted? The man that breaks any of these oaths even slightly is condemned to eternal shame. I am as prone to temptations as any other man, but I believe, even though I was the most reluctant, I will be the last one to break these oaths. Will we be allowed any entertainment at all? Ay, that there is. Our court, you know, is haunted With a refined traveller of Spain; A man in all the world's new fashion planted, That hath a mint of phrases in his brain; One whom the music of his own vain tongue Doth ravish like enchanting harmony; A man of complements, whom right and wrong Have chose as umpire of their mutiny: This child of fancy, that Armado hight, For interim to our studies shall relate In high-born words the worth of many a knight From tawny Spain lost in the world's debate. How you delight, my lords, I know not, I; But, I protest, I love to hear him lie And I will use him for my minstrelsy . Of course there is. Our court, you know, is visited regularly by a stylish traveler from Spain, who always appears in the latest fashions and has a variety of witty expressions to deliver. The words he speaks are like music to me, they have a magical, enchanting quality. He is a man who is always polite, and he sits in between right and wrong, almost like an umpire in their game. This fantastic creature, called Armado, will be a break from our studies, and can tell us in noble words, the achievements of many knights from sunny Spain, that have been forgotten because of all the fighting we've been doing. I don't know what pleases you, my lords, but I must admit, I love hearing him lie and I will use him for my entertainment. Armado is a most illustrious wight,A man of fire-new words, fashion's own knight. Armado is a very renowned person, he is a man who makes up new words, and is a true knight of fashion. Costard the swain and he shall be our sport;And so to study, three years is but short. The servant Costard and him will be our entertainment and we will study like this. Come on, three years isn't actually that long. DULL enters with a letter, bringing COSTARD with him. Which of you represents the Duke? I do, what do you want? I myself reprehend his own person, for I am hisgrace's farborough: but I would see his own personin flesh and blood. I too represent the Duke, for I am his thirdborough in this town. Still, I would like to see the Duke himself. Signior Arme—Arme—commends you. 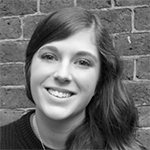 There's villanyabroad: this letter will tell you more. Signior Arme...Arma....hopes you are well. There have been bad things happening abroad, this letter will tell you more. Sir, the contents of this letter are about me. However bad the matter is, I hope to God that he speaks with good words. Good words are a bad sort of thing to hope to God for. Instead, let's ask him to give us patience! Patience to listen? Or patience to stop ourselves from laughing? To hear meekly, sir, and to laugh moderately; or toforbear both. To listen patiently, sir, and only laugh a little, or to do neither of these things. Well, sir, be it as the style shall give us cause toclimb in the merriness. Well sir, let's hope the style is good enough for us to enjoy it. The matter is to me, sir, as concerning Jaquenetta.The manner of it is, I was taken with the manner. The matter is related to me, sir, as it concerns Jaquenetta. The fact is, I was found with Jaquenetta. In manner and form following, sir; all those three: I was seen with her in the manor-house, sitting with her upon the form, and taken following her into the park; which, put together, is in manner and form following. Now, sir, for the manner,—it is the manner of a man to speak to a woman: for the form,— in some form. In all three of these ways sir: I was seen with her in the manor-house, I sat with her on a bench, and was caught following her into the park. All three of these things put together have led to my arrest. Now sir, to speak about customs—it is the custom of a man to speak to a woman, it is a habit, in some sense. And what we are about to hear? As it shall follow in my correction: and God defendthe right! After it I will be punished, and may God defend me! Will you listen to this letter carefully? As if we were listening to a prophecy. Men are so stupid to not be able to resist women. [Reading] "Great leader, the heavenly commander and only ruler of Navarre, my soul's god on earth and my body's protector." No mention of Costard yet. It may be so: but if he say it is so, he is, intelling true, but so. That might be true, but telling the truth isn't even worth much nowadays. Peace be to me and every man who doesn't stick up for themselves! I ask you to stop talking about other men's private affairs. [Reading] "So this is what happened. I, filled with the darkest sadness, decided to ease my melancholy by giving it the medicine of some fresh air, and, on my word as a gentleman, I went for a walk. At what time? Around 6pm, the time when most animals eat, most birds peck at their food, and most men sit down to enjoy their evening meal. So much for that. Now you ask, what ground? What ground I walked upon. It is called the park. Then you ask where? Where I mean, that I saw the obscene and ridiculous event, that I have been forced to write about with my white goose-quill pen and my black ink, and that you are being forced to view, witness, analyze and see? As to the place where it happened, it was somewhere in between the north and the north-east from the secret place in the west of your complex garden. It was there that I saw this vile servant, so small that he should be laughed at." [Reading] "That illiterate, stupid boy,"
[Reading] "who, if I remember, is called Costard,"
[Reading] "who associated himself with and mingled, against your fixed oath and your rules, with, oh it pains me to say who with." [Reading] "with a child of Eve, a female, or if it helps you to understand it better, a woman. Encouraged by my sense of duty, I have sent him to you to be punished, along with your sweet grace's officer, Anthony Dull—a man who has a good reputation, behavior, manner and opinion." That's me, if it pleases you. I am Anthony Dull. [Reading] "As for Jaquenetta, as she is the weaker of the two that I caught, I will keep her as a symbol of the law's anger and will, whenever you want me to, bring her to trial. Yours, with respects to my devoted and burning sense of duty. ADRIANO DE ARMADO." This is not so well as I looked for, but the bestthat ever I heard. That is not as good a matter as I had hoped for, but it is one of the best letters that I have ever heard. Ay, the best for the worst. But, sirrah, what sayyou to this? Yes, it is the best example of something awful. But, boy, what do you have to say for yourself? Sir, I admit to being with the wench. I do confess much of the hearing it but little ofthe marking of it. I confess that I did hear it but I didn't pay much attention to it. It was proclaimed a year's imprisonment, to be takenwith a wench. It was announced that if you were found with a wench, you would be imprisoned for a year. I was not found with a wench, sir, I was found with a damsel. Well then, the same applies to a "damsel." Then she was not a damsel either sir; she was a virgin. That is just the same thing expressed in different words; it also applies to "virgin." If that's true then she is not a virgin, I was found with a maid. This maid will not help you sir. This maid did help me sir. Sir, I will pronounce your sentence: you shall fasta week with bran and water. Sir, I will now announce your punishment. You will fast for a week with only bread and water. I would rather pray for a month with some mutton and porridge. And Don Armado shall be your keeper.My Lord Biron, see him deliver'd o'er:And go we, lords, to put in practise thatWhich each to other hath so strongly sworn. Don Armado shall look after you. My Lord Biron, take him to his house immediately. My lords, we shall go and start to live our lives according to the promises we have made. FERDINAND, LONGAVILLE, and DUMAIN exit. I'll lay my head to any good man's hat,These oaths and laws will prove an idle scorn.Sirrah, come on. I know for certain, these oaths and laws will prove to be pointless soon enough. Come on boy. I suffer for the truth, sir; for true it is, I was taken with Jaquenetta, and Jaquenetta is a true girl; and therefore welcome the sour cup of prosperity! Affliction may one day smile again; and till then, sit thee down, sorrow! I will be punished for the truth sir, for it is true, I was found with Jaquenetta and she is a true girl. Therefore bring on my suffering! My fortunes might one day turn around and until then, be patient sadness! Strange, Lani. "Love's Labor's Lost Translation." LitCharts. LitCharts LLC, 19 May 2017. Web. 20 Apr 2019. Strange, Lani. "Love's Labor's Lost Translation." LitCharts LLC, May 19, 2017. 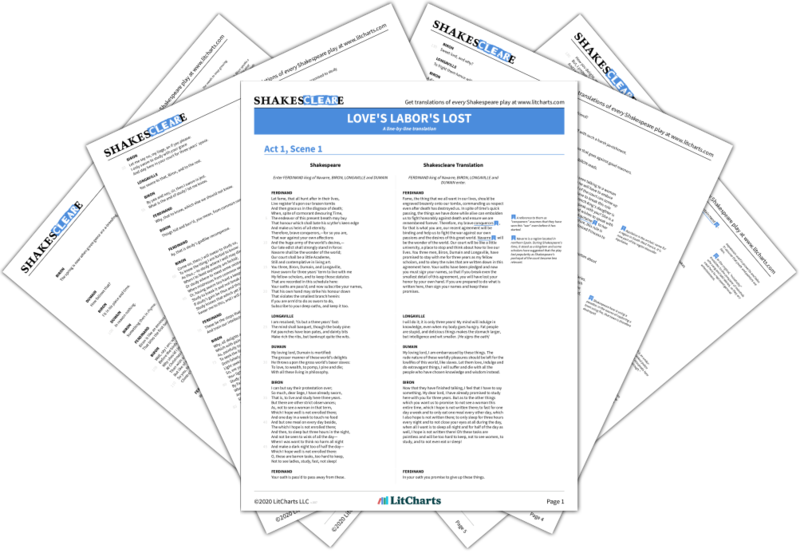 Retrieved April 20, 2019. https://www.litcharts.com/shakescleare/shakespeare-translations/loves-labors-lost.